Hello all! Hope your week has started out okay. My day started with a phone call from my Mom. She was crying so hard I could hardly understand what she was saying. I picked up on the word Holly and went with it from there. She said she was up all night crying over her. I wish I had known because so was I. Some days are just really, really difficult. 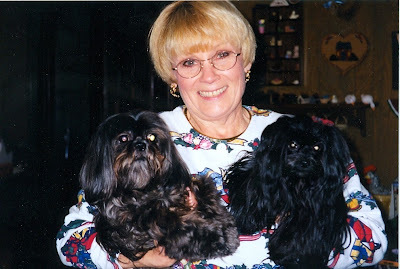 My Aunt Media had a solid black Shih Tzu, Snookie, that she lost a few years ago and had just as long as we had Hol. Mom talked to her yesterday and she said she cries almost every day over her. Hearing that made me sad. I think I'll be the same way. You can be blessed to have a lot of great dogs in your life but I don't think you get it until you have 'THE" one. This photo was taken Christmas Day probably somewhere between 97-99. I've mostly stayed home today. For the first time in a while I didn't have anything to do. So I hung with my girls. They really are very calm for pups but they were exceptionally calm today. Like, Holly calm. It almost worried me that something was wrong. Maybe they're finally getting settled in? Maybe it's because I was home with them all day? Or maybe the rumor really is true that Shorkies are the calmest dogs ever? Who knows. I've found so many dead bugs in my house lately and, of course, my over-paranoid self is worried they ate one and are now infected with diseases and it's making them sick. We had a bug spray guy come a few weeks ago but I bet I pick up 6 dead bugs a day and I'm close to making a "what's the deal?" phone call. Speaking of what's the deal, we've totally gone backwards in potty training today. All weekend I would have said they were 80% potty trained but today I would say 20%. What's that about? I'm so confused. I was so proud of them. Today has been odd. Too calm--no potty training abilities. Weird. And normally Ivy is so excited to perform tricks for treats but shes totally not into it today. Maybe they don't like Mondays?